A small group of students from the Community Research Seminar, Ryan Breen, Ellen Chang, Michelle Rosen, and Suet Ning Wong, presented their work to community partners, faculty, staff, and students with the help of TA Rebecca Jacobsen. Their presentation, titled “Exploring Factors for High School Success in Middletown,” was created in partnership with the Middlesex Coalition for Children. Their research sought to determine factors that influence student success in Middletown Public Schools, which includes eight elementary, two middle, and one high school. Using the indicators of GPA, high school graduation, and attendance, the students studied three cohorts of students from the graduating classes of 2012, 2013, and 2014. Their research strategy was to compare their fourth grade behavior with indicators of high school success in their senior year. The team was specifically interested in finding correlations in low-income students and students of color. One factor they hoped to analyze was whether students had attended their neighborhood school or had been bused to a different school in compliance with the Connecticut Racial Imbalance Law. However, in compiling their data, the team found that many files were missing. Some students who had been in the Middletown district in both 4th and 12th grade had incomplete files or inconsistencies in their records. Other students had attended elementary school in Middletown and moved out of the district before high school and therefore couldn’t be tracked. By the time the team narrowed down their study to the students who they could access complete records for, their sample size was too small to find statistical significance. 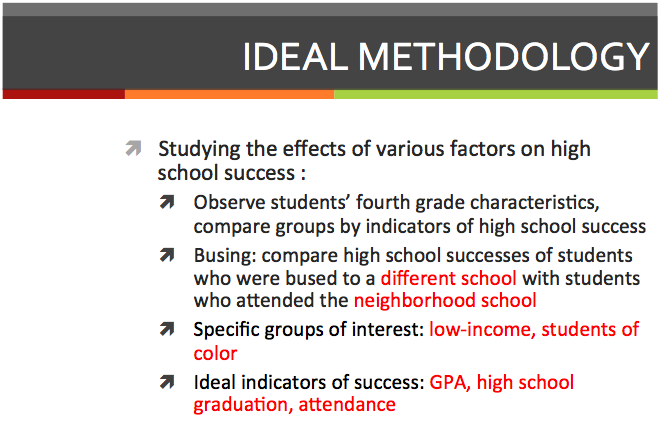 While they hoped to present data on how busing, race and ethnicity, family income, neighborhood opportunity level, and school opportunity level influenced student success, their research ended up pointing to a different problem. In order to accurately measure and judge educational interventions such as busing, school districts need better records of student data.